What IS the difference between design-build and collaborative delivery? They are essentially the same. Design-build (DB) is the term most are familiar with -- an integrated approach for new construction, additions, or renovations, where an engineer, architect (or designer), and the contractor collaborate under a unified contract to design and build the project. The use of the term collaborative delivery reinforces the collaborative relationships among the various parties as shown below. This approach has been proven to result in a quality end product, with cost and time savings. 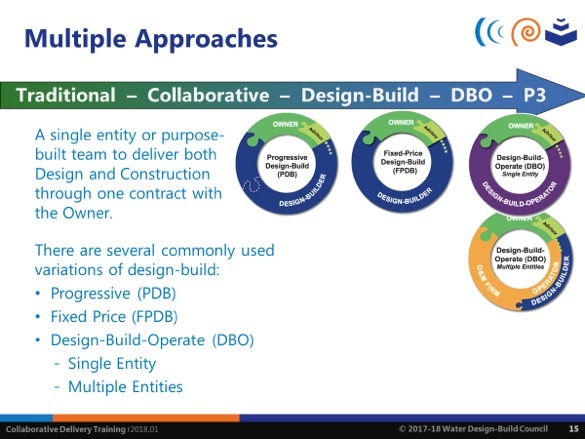 Collaborative delivery is in contrast to the basic design-bid-build (DBB) approach in which the owner holds all responsibility for the multiple contracts. With DBB, the owner must first hire the designer to create the plans; then send those plans to general contractors to openly bid on the construction, and then award the project to the lowest cost contractor to build the work. What are the advantages of design-build delivery? Depending on the design-build delivery method selected, this approach allows an owner to select a team based on their qualifications, approach, and preliminary conceptual designs, eliminating many of the challenges associated with a multi-level and time-consuming team procurement process. A design-build delivery method engages the designer and builder on the same team. Throughout the duration of the project, this team works together to develop a design and work plan that may save time and money. While designs are being developed, partners can weigh in on practical matters such as functionality of building, practicality of construction methods, and necessity for pre-ordering long-lead items. During construction, the contractor can directly clarify questions with the designer without having to go through a formal request for information (RFI) process. Cooperation can be a win-win, and cooperative project delivery provides the best value overall. Design-build mitigates the owner’s risk. When a single contracting entity is responsible for design, cost, schedule, and performance, owners share in the allocation and management of risk responsibilities. In addition, design-build offers a more efficient procurement process, reducing the time required to administer multiple contracts. Once risks are identified, in collaboration with the owner, the design-builder develops an acceptable plan for managing, mitigating, and allocating them to those team members who are best able to manage those particular risks. In essence, design-builders are committed to implementing the best, customized solution for each project. How exactly does design-build save me time and money? Owners reported in WDBC’s “Lessons Learned Research” that these delivery methods can often realistically put a facility in operation 30% sooner, maximizing the savings associated with efficiency of design, meeting compliance requirements faster, and providing a higher quality product sooner to the end user. They also emphasized that these results rely on goal alignment and collaboration. The collaborative process can address factors that may drive up costs. For example, there are typically fewer change orders on DB projects. When design development is a collaborative process involving the owner, engineer, and construction professionals, issues or project challenges can be identified early and solutions reached among the team members prior to establishing a GMP. This process reduces the likelihood of expensive construction change orders. How do I go about using design-build for my project? Once you have confirmed that design-build is permissible in your area, the steps for procurement are pretty straightforward. A multi-step selection process is common, beginning with a request for qualifications (RFQ) issued for design-build teams. The most qualified teams are shortlisted. The request for proposals (RFP) is issued and interviews are conducted. In some cases, the teams are given a stipend and asked to provide a preliminary design as part of their proposals. The proposals are evaluated against a set of criteria, which should include the team’s apparent ability to work together toward a common goal. When a design-build team is selected, their mission is to actively collaborate with owner representatives to develop the project with an eye toward function and practicality. They weigh the costs and benefits of each design choice with the alignment of the owner’s goal of achieving the best value available within the designated budget and schedule. WDBC’s 2017 research on the demand for the use of collaborative delivery shows that cost, risk, and delivery time drivers have resulted in increasing numbers of owners using design-build delivery for water and wastewater projects. The report also concludes that this use will become even greater over the next decade and beyond as U.S. utilities confront increasing regulatory requirements, service demands of growing populations, and replacement of aging infrastructure. The future for the use of design-build delivery methods for the water and wastewater infrastructure is a positive one that will continue to grow as owners pursue this approach. Christy Wolfe is a professional services marketer for HDR and serves as a representative on the Water Design-Build Council’s Communications Committee. Her perspective on design-build is informed by a professional history working for architectural, engineering, and construction firms for nearly 20 years.